B.J. serves as a Visiting Professor of Law at King Hall School of Law at the University of California, Davis, as an Adjunct Professor at UC Davis Graduate School of Management, and he is a former Adjunct Professor at the McGeorge School of Law. 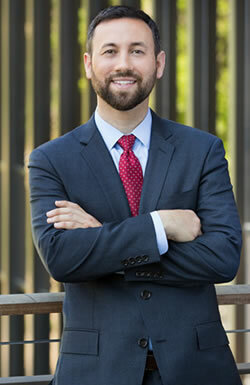 He is also a frequent speaker at continuing education courses offered by CEB and the Sacramento County Bar Association. B.J. received his J.D. from the University of California, Davis School of Law, and his M.B.A. from University of California, Graduate School of Management. He also earned his E-LL.M. in taxation from New York University. B.J. is a past president of the Sacramento County Bar Association and is a past Sacramento Business Journal “40 Under 40” honoree. He was named in the Sacramento Business Journal’s 2018 “Best of the Bar” list which recognizes top local attorneys who have been nominated by their peers and vetted by a panel of their peers. He is also listed as a Rising Star in Northern California Super Lawyers and was named to Sacramento Magazine's 2016 and 2019 Top Lawyers Lists. Advise corporations, limited liability companies, partnerships and individuals on various business considerations, including entity formation, mergers and acquisitions, intellectual property matters, executive compensation, financings, joint ventures and succession planning. Advise businesses on tax planning considerations, including reorganization and liquidation strategies. Advise companies and individuals on executive compensation issues, include deferred compensation plans, phantom stock bonus plans, stock options and other management level incentive plans. Advise nonprofit entities on issues related to formation and maintaining tax-exempt status. Provide various litigation support services, including the identification of claims and defenses, as well as the analysis of fiduciary duties and valuation/forensic reports.